Gum disease is not something to scoff at. It is something that can affect all aspects of your overall health, not just impede your oral health. If you have symptoms of gum disease that continue to get worse, you need to come into our office and let us help get treatment started. The sooner we begin treatment, the healthier you are going to be. Here are some signs of periodontitis that you never want to ignore. Come In and See Us If…. If you notice that your gums are bleeding each time you brush, you need to come in and see us. Once in a while could be chalked up to rough brushing. However, all the time is not a good sign. 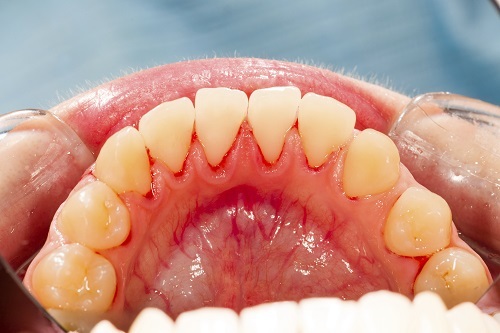 Gums that are swollen, puffy, and/or tender when you touch them also need to be treated. These signs are telling you that your body is struggling with the infection in and around your gums. Swelling is a sign that there is inflammation. Do not ignore this sign. Instead, call us so we can help. If you have spaces that show up between your teeth that were not there before, you need to also call us and come in. It is never a good idea to allow your teeth to spread out and do nothing about it. If you notice that those spaces are getting taken up by pus, then you need to come in as soon as you can. This is a sign that the infection is spreading to a dangerous level. Call us right away! Do not ignore any type of sign that your gums are in trouble. Give our office a call and let us help see what options you have to treat the infection. The sooner we get treatment started, the better we can restore your oral health.